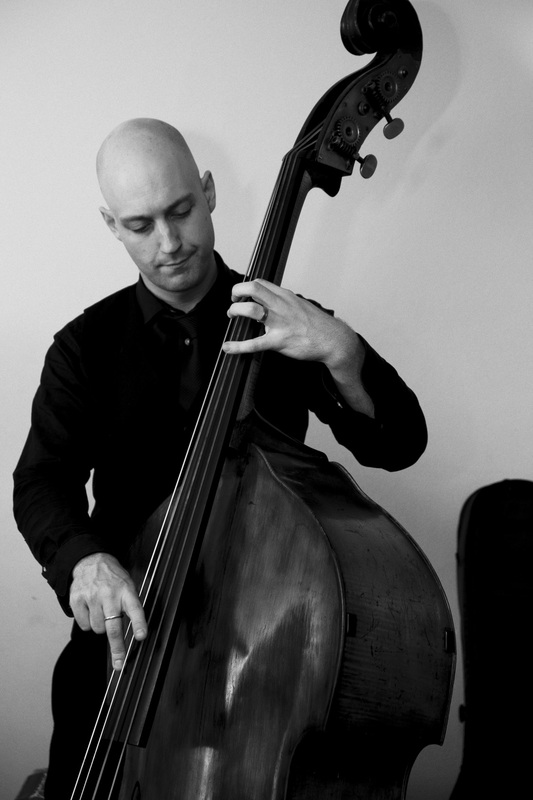 Just received some beautiful black & white photographs of Sydney Jazz Collective performing our opening acoustic trio set for a recent wedding at Balmoral Bathers’ Pavilion. These photos were taken by the Talented Mr Brindley (Robert from Brindley Images). We had a lovely day it could not have gone better with fabulous weather, celebrating with friends and family and wonderful music. The Sydney Jazz Collective were absolutely fabulous! The music really set the scene and we were very impressed with the band by going out of their way to learn an italian folk song that is very dear to the italians that attended the celebration. Both Neil and I were touched by all the italian songs you played and the guests were up and dancing !! Thank everyone for their great efforts !! Thanks to Nicole Katsonos from Two Birds Photography for this image. 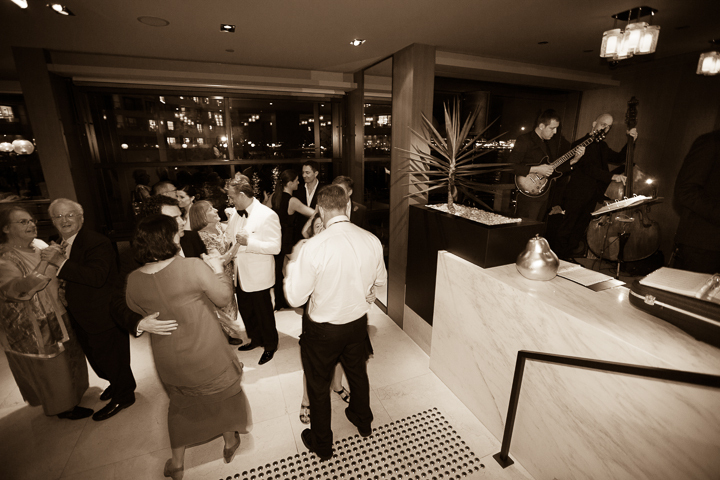 The band had a great night recently performing for the wedding reception of Boronia & Trevor at Park Hyatt Sydney. 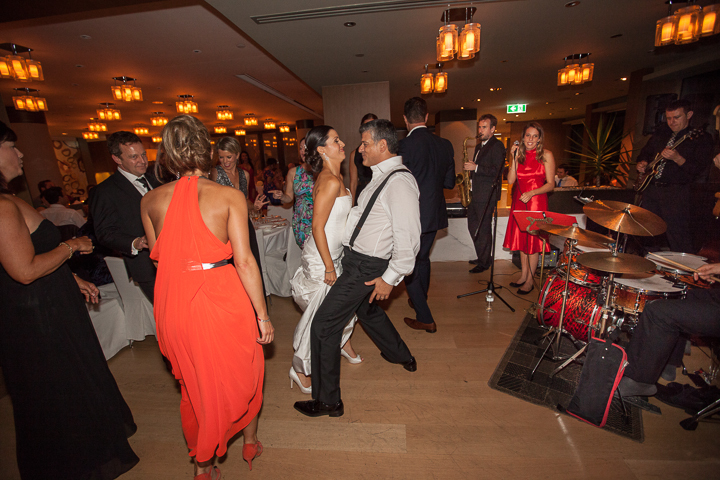 With the lights of Sydney harbour across the water, warm evening weather, and guests who really liked to party – the dance floor got a solid workout! Thanks to photographer Steven Lloyd for capturing these shots. Hi Tom, Just a quick note to thank you and the band for Saturday night. It was such a whirlwind that unfortunately I didn’t get to thank everyone on the night. They were absolutely wonderful. They really created a fantastic mood and all the guests complimented the music. Thank you again, kind regards. Another quick snap from a sparkling daytime wedding Sydney Jazz Collective performed for Ling Ee Tay at Dunbar House, Watsons Bay. This venue looks fantastic after the recent renovations they have completed there. Thanks to photographer Katsu Nojiri for the shot below. Thank you and the SJC for being available to play at our wedding last year. The entire experience was great! The only regret we have was that it was too short! For the moments we did manage to catch, it brought such a smile to our faces. All our guests complimented on how fantastic the music was and kept asking for the name of the band that was playing. Thank you again for everything! Some fresh images hot off the press from a beautiful coastal-meets-rural wedding in Macksville. Amazing wedding, fun road trip for the band, and at the end of the night the bride & groom drove away in one of the hippest cars we have ever seen – will try to track down a photo of that and post it here too. 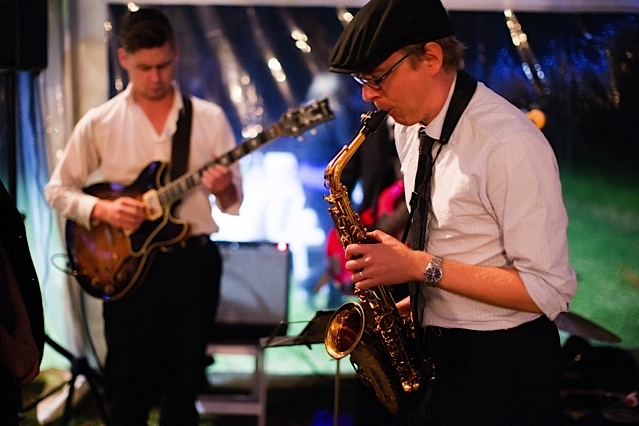 We asked the Sydney Jazz Collective to play at our engagement party in Sydney, and they were so fantastic, that we asked them if they would consider playing for us again at our farm wedding on the East Coast of NSW. Tom was very professional to communicate with and the band fitted seamlessly into the events of the day. You’d only have just noticed their arrival and moments later relaxed jazz sounds filled the garden as our guests helped themselves to champagne. They knew how to pick the mood of the crowd, whether it was to fill the gaps between conversation or to get the party moving with some more well known contemporary grooves to fill the dance floor as the night got going. We also asked them to play live the song for our first dance – Angus & Julia Stone’s “The Wedding Song”. We had not heard their rendition before we took to the dance floor and were bowled over by how soulful and rich it sounded, and later, all the glowing comments from our guests indicate that we weren’t the only two impressed. We are definitely going to recommend you to our friends. Here are a couple of atmospheric black & white photos taken on the gig by our multi-talented male vocalist (and resident instagram guru) Edoardo Santoni. – Able to set up and perform in an organised manner without needing to badger us for information. Overall, the band was so easy to work with. Everyone enjoyed their work and we would be more than happy to work with them again and recommend them to anyone else that is looking for something similar. Thanks again. So our appearance on the Premier’s video was very brief (see 4 min 11 sec) – but we had a great time performing in our Instrumental Jazz Trio configuration for the Premier’s Awards for Public Service recently held at the Darling Harbour Convention & Exhibition Centre. Congratulations to all the winners who were recognised for the hard work they have put in throughout the year! We performed at a beautiful Hunter Valley wedding for Monique & Andrew Carceller over the weekend which was held at Peppers Convent in Pokolbin. They have a big marquee which can be set up on the lawns near the front, and I think most of the guests also stayed overnight in the main building pictured below. This is just an iPhone snap we took of the main building, but we also made some live recordings on the night – so I will upload some of those here later this week! The theme for the night was Gangster / Gatsby and included a myriad of jugglers, acrobats, aerial trapeze & character actors – very well planned and great fun to perform at. Thanks to Adriano and his team from SightLine for managing sound on the night.